Chamelia has a problem fitting in. A girl with fashion sense, flare, and a desire for the limelight, she has the misfortune to be born a chameleon. After all, blending in is what it's all about when you're a chameleon. At school, everybody is green. Everyday. They dress in sensible, basic neutrals and try to slip by under the radar. That is not Chamelia's style. Bright colors, bold prints, plenty of feathers and frippery, bows and baubles are more her style. When she plays Goldilocks in the school play, she dresses as a Viking warrior maiden, giving the kid playing Father Bear more than the usual surprise when he finds her sleeping in Baby's bed. When she goes biking, her helmet has bright designs and a long plume on top. And she insists on playing soccer in sequined platform shoes. She HAS to get herself noticed--no matter what she does. But her parents and teachers point out that she needs to balance her act. There's a time when standing out in the crowd is not a good idea, when joining in is the way to go. Can she find a way to be one of the group and still be her outstanding self? 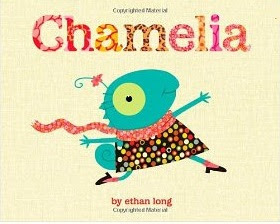 Ethan Long's easy-going little picture book, Chamelia (Little, Brown, 2011) shows the opposite of the usual story of the shy child who learns to take her turn in the spotlight, and his charming little Chamelia becomes a model of the middle way, a chameleon who learns to blend in and be herself at the same time.